You Were Always Mom's Favorite! The second edition of the highly successful Handbook of Discourse Analysis has been expanded and thoroughly updated to reflect the very latest research to have developed since the original publication, including new theoretical paradigms and discourse-analytic models, in an authoritative two-volume set. Through everyday talk, individuals forge the ties that can make a family. Family members use language to manage a household, create and maintain relationships, and negotiate and reinforce values and beliefs. The studies gathered in Family Talk are based on a unique research project supported by the Alfred P. Sloan Foundation in which four dual-income American families recorded everything they said for a week. This book extends our understanding of family discourse and of how family members construct, negotiate, and enact their identities as individuals and as families. 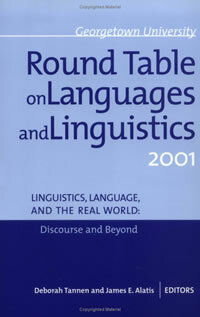 The volume also contributes to the discourse analysis of naturally-occurring interaction and makes significant contributions to theories of framing to theories of framing in interaction. The concept of framing has been pivotal in research on social interaction among anthropologists, sociologists, psychologists, and linguists. This collection shows how the discourse analysis of frames can be applied to a range of social contexts. The book provides a seminal theoretical framework for conceptualizing the relationship between frames and schemas as well as a methodology for the discourse analysis of framing in interaction. Our everyday lives are increasingly being lived through electronic media, which are changing our interactions and our communications in ways that we are only beginning to understand. In Discourse 2.0: Language and New Media, editors Deborah Tannen and Anna Marie Trester team up with top scholars in the field to shed light on the ways language is being used in, and shaped by, these new media contexts. Designed for scholars and students interested in current research in the field of discourse analysis, this collection provides a foundational paradigm that is broad enough to support a variety of approaches, methods and even definitions regarding the study of discourse. 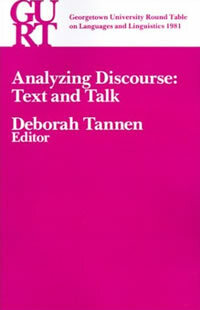 The Handbook of Discourse Analysis serves as a comprehensive and authoritative guide to the central issues in contemporary discourse analysis.